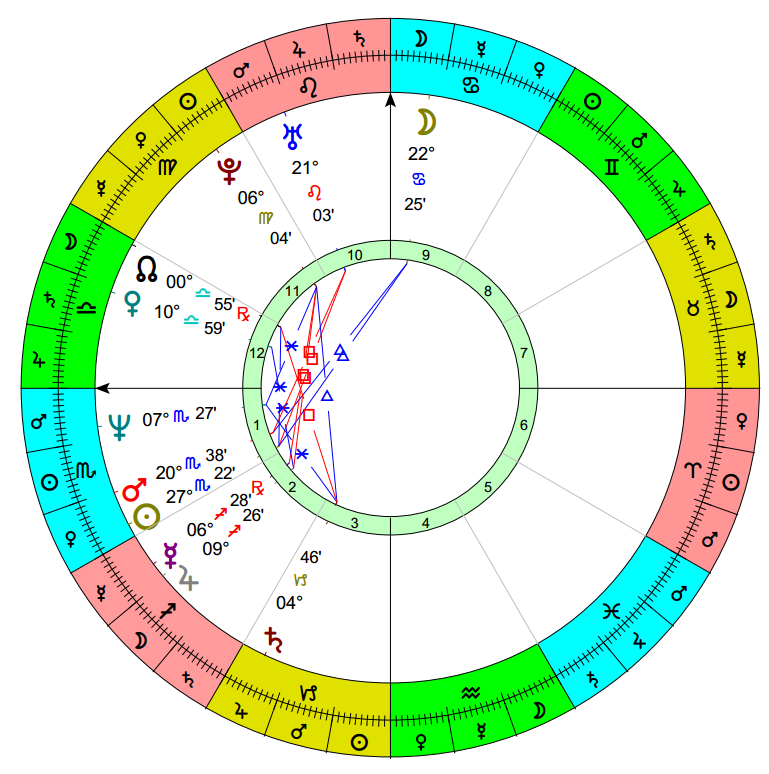 ← A puzzling horary chart. Any comments? Sybaritic German bishop Franz-Peter Tebartz-van Elst loves to spend his parishoners’ donations on personal comforts. The bishop collects huge sums of money for his personal use because Germany’s 24 million registered Catholics are required to make a compulsory contribution to the Church from their income tax. The Germans apparently don’t know about separation of Church and State, which certain far right politicians are trying to abolish in the USA. Luxury Bishop of Limburg and his tasteless palace. 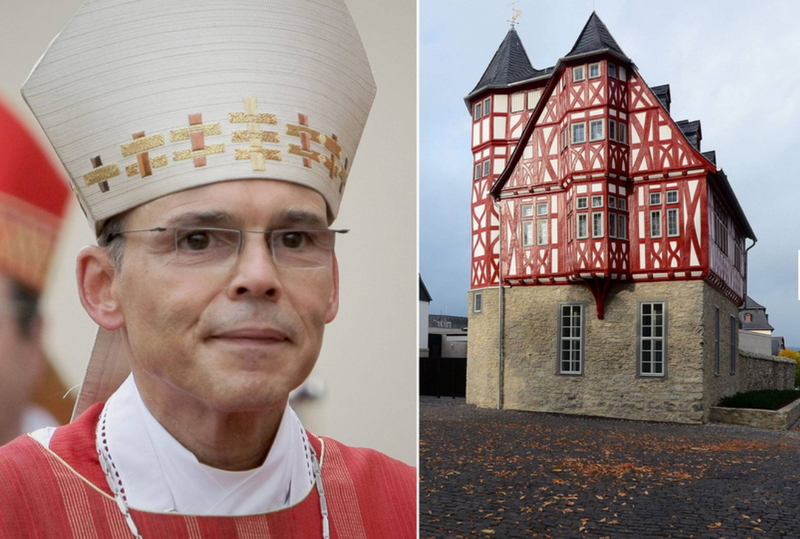 According to news reports, the bishop of Limburg spent €15,000 on a bath and €31m renovating his residence, as part of his plan to spend €350,000 on walk-in wardrobes for his palatial home in the ancient town of Limburg near Frankfurt. Currently 1 Euro is worth 1.36 US dollars. He apparently delayed some of the construction when the new Pope in Rome got wind of the bishop’s lavish lifestyle and Martin Luther started turning over in his grave. Rumor has it that Pope Francis was considering conversion to Lutheranism. In all fairness, this bishop does try to raise money for the starving children in India. He even flies to India in the first class section of a jumbo jet to see how the poor kids are doing. He may even have brought the kids some of the caviar he took from his meal tray in the first class section of the plane. Ordained as a priest on 26 May 1985. Ordained as a bishop on 18 January 2004. Appointed bishop of Limburg on 28 November 2007. Installed as bishop of Limbury on 20 January 2008. Here is the bishop’s natal chart (time unknown) cast for Noon in Germany on his birth date with sun sign houses. Bishop Tebartz-van Elst, born 20 November 1959, time unknown. Noon chart, sun sign houses. Where would we look for a love luxury in a chart? Venus loves adornment and elegant surroundings. Jupiter loves extravagance. Natally his Venus in Libra closely sextiles his Jupiter in Sagittarius. Both Venus and Jupiter are highly dignified in the signs which they rule. This Venus/Jupiter sextile may give him a taste for luxurious surroundings. In the sun sign chart, Jupiter occupies and rules the 2nd house of money and possessions. Jupiter also rules the 5th house of pleasures and amusements. Venus occupies and rules his 12th house of self-undoing (he’s in trouble now with the Vatican for his lavish lifestyle). This chart is remarkable in that so many of the planets are highly dignified, occupying the signs that they rule. Saturn lies in Capricorn, Jupiter in Sagittarius, Mars in Scorpio, Venus in Libra, and the Moon in Cancer. Saturn, Venus and the Moon occupy enterprising cardinal signs. Only his Mercury is debilitated, lying in its detriment and travelling Retrograde. The lead planet in this chart is the Moon in Cancer. If he was born after after 7 AM, the Moon lies in the 3rd decan of Cancer which corresponds to the tarot Four of Cups. Aleister Crowley called this card “Luxury.” It seems fitting that the chart of the Luxury Bishop is led by his Moon in the region assigned to Luxury by the tarot. 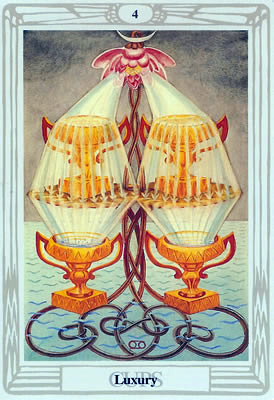 The Four of Cups, which Crowley named ‘Luxury,” corresponds to the 3rd decan of Cancer in the zodiac, which is associated with both greed and abundance. The bishop’s being summoned to the Vatican to account for his lavish lifestyle is most likely part of his second Saturn return. He has three natal planets in Scorpio: Neptune, Mars and the Sun. Saturn entered Scorpio in October of 2012. Saturn conjoined his natal Neptune on 8 Dec. 2012, 8 May 2013, and 4 Sept. 2013. Saturn will cross over his natal Mars on 2 Jan. 2014, 4 May 2014, and 30 Sept. 2014. Saturn will conjoin his natal Sun on 28 Nov. 2014. The Pope called this ‘archbishop of bling’ to Rome and suspended him. The multi-million dollar residence will be converted into a homeless shelter for the poor. This entry was posted in Astrology, Tarot and tagged Limburg, Luxury Bishop, pope, Tebartz-van Elst, Vatican, Venus in Libra. Bookmark the permalink. Russell, how true! but I couldn’t resist casting a stone. Guess that means I’m destined to burn in hell. Oh, well! 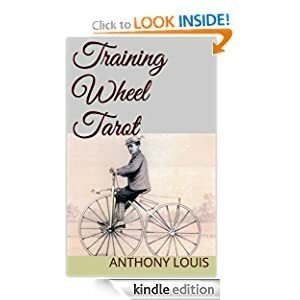 Since looking more seriously at astrology, I can’t help but think that what is in the birthchart will manifest pretty much regardless of one’s own efforts. Some people seem to attract wealth, others (I speak from experience) don’t. Either way, is there anything one can do about it? I think the free will idea is over rated. Incidentally, can you recommend a good textbook on traditional astrology? I think the birth chart will manifest in a general way but the specifics of what we do with it are up to us. This bishop, with Venus sextile Jupiter, has a love of beautiful and elegant things. He could put that to good use in the service of others, or he could direct it into living a life of luxury. The choice is his. A good basic book on traditional medieval/Renaissance astrology is the one by Avelar and Ribeiro: On the Heavenly Spheres. Chris Brennan is working on his volume about Hellenistic astrology but it is not yet finished, as far as I know. Tony, thank you for the books, I will check them out. Regarding choice though, surely Venus in the 12th House will remain a weakness whatever choices he makes? Venus is in the 12th in this solar sign chart, so that it is in the 12th with reference to placing the natal Sun sign in the 1st. We don’t have an exact time of birth, so that at the actual time of birth Venus may be in one of his other houses. Even if Venus were in the 12th at the actual moment of birth, it is only a potential weakness. Someone with Venus in the 12th could put it to use in the arts, film making, charitable work, etc., and it could become a strength. For example, the actress Angelina Jolie has Saturn and Venus in the 12th. Her decision to have a double mastectomy has done much to publicize breast cancer and may have saved many lives. Of course, I overlooked that. I don’t suppose the Vatican has a list of birthtimes for it’s bishops? Somehow that seems unlikely but on the other hand you’d think they would keep an astrologer on the books somewhere…. I believe the official position of the Church is the backwards belief that astrology is the work of the Devil and will lead the faithful away from salvation. but the listings only seem to go up to 1958. If I find anything else I’ll let you know of course.